Amnesty International welcomes today’s ruling by the Canadian Human Rights Tribunal which has ordered the federal government to take immediate action to end the discriminatory underfunding of child and family services for First Nations children on reserves and in the Yukon. Although the provinces and territories have jurisdiction to set standards for child welfare services, the federal government sets the funding levels for those services delivered to First Nations children and families on reserves and in the Yukon. The discrimination complaint, initiated by the First Nations Child and Family Caring Society and the Assembly of First Nations, first came before the Tribunal in 2008. Amnesty International intervened in the case, as did Chiefs of Ontario. For the past eight years, the federal government has argued against the case every step of the way, claiming that the prohibition of discrimination under the Canadian Human Rights Act is too narrow to apply to the federal government’s funding decisions. The federal government also argued against the application of international human rights standards such as the Convention on the Rights of the Child and the United Nations Declaration on the Rights of Indigenous Peoples in the interpretation of the Canadian Human Rights Act. The Tribunal ordered the federal government to “cease its discriminatory practices” and reform its funding system to reflect the Tribunal’s findings. The Tribunal also ordered that the federal government “take measures to immediately implement the full meaning and scope of Jordan’s Principle”, which requires that government actions to meet children’s needs must not be delayed or obstructed by jurisdictional disputes between different government departments or different levels of government. Finally, the Tribunal announced that it will initiate a process to address the longer term, systemic reforms sought by the Caring Society and the Assembly of First Nations. Amnesty International is calling on the federal government to accept the Tribunal’s findings and to work collaboratively with the Child and Family Caring Society and the Assembly of First Nations to ensure full and timely implementation of the long-term reforms they proposed. 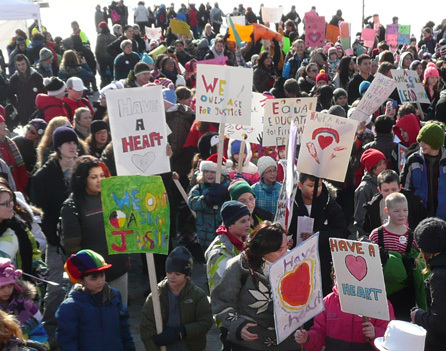 Because similar patterns of discriminatory underfunding limit the quality and availability of many other basic services needed by First Nations children, including education and health, the federal government should commit to working with First Nations to eliminate all inequalities in services to First Nations children, including through the full implementation of Jordan’s Principle. Amnesty International thanks Justin Safayeni and Stockwoods LLP for representing the organization through the Tribunal process and related legal hearings.